“Cardinals often come to visit,” says Lynn Mullen, pointing to bird feeders in her and husband Dennis’ Scottsdale backyard. And, as if on cue, one of those scarlet visitors lights on the branch of a mesquite tree, flies down to a bush, and surveys the scene. 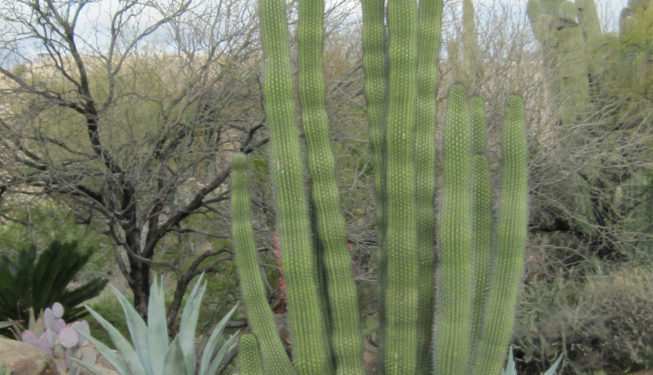 Feathered friends and the human variety find much that is wondrous in this Sonoran Desert oasis. Lynn, an interior designer, has added bursts of color in art, seating and other amenities to the south-of-the-border-style setting. 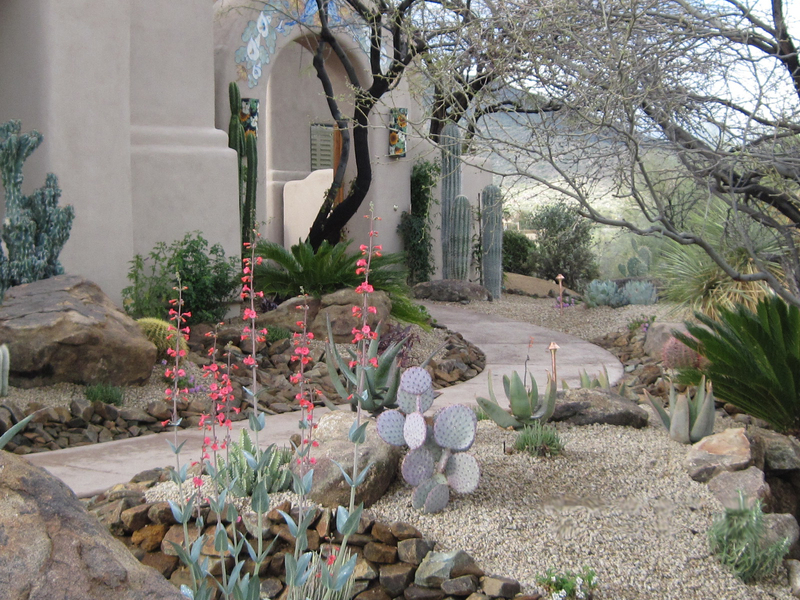 Cozy sitting areas and spots for alfresco dining abound, and whimsical stone sculptures peek out from planted beds. 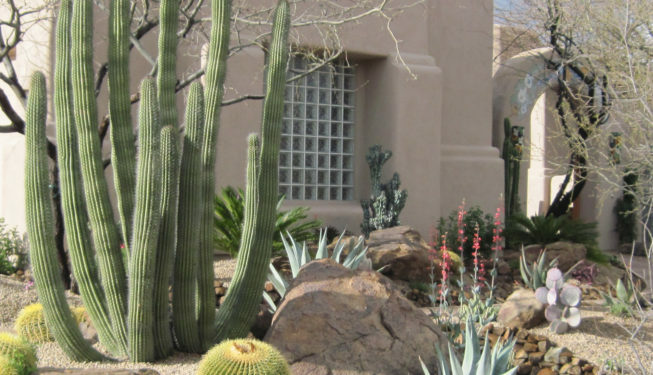 According to the homeowners, these garden accents—many of which reflect their trips to Mexico—are complements to the real show-stoppers: eye-catching plants in their refurbished outdoor spaces. 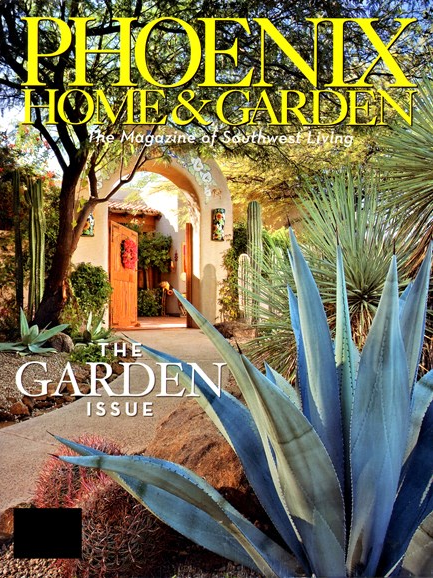 Landscape designer Marc Vargas and the crew from Desert Foothills Landscape created the densely vegetated look the Mullens desired in front of their Hacienda-style home, in its enclosed entry courtyard, and throughout the backyard. When Vargas came on board, the property had “lots of hardscaping and limited spaces for planting,” he recalls. 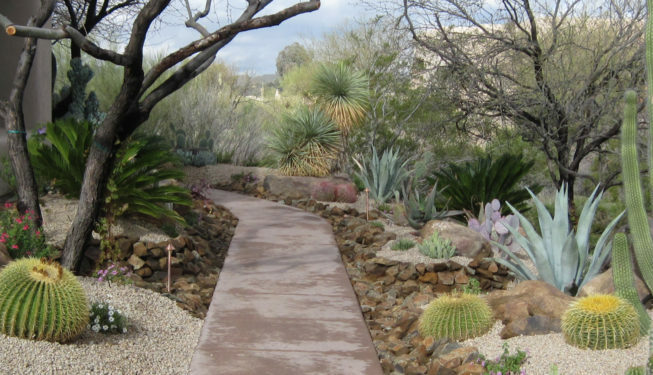 While the hardscaping remained, the addition of plants transformed the grounds into something magical. 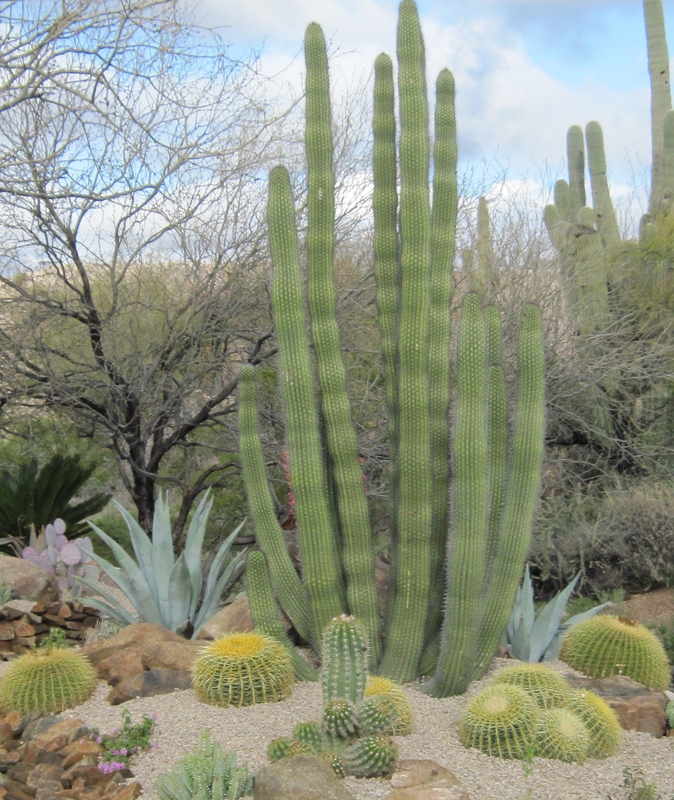 Among those plants: Specimen cacti in fascinating shapes reflect the desert surroundings. 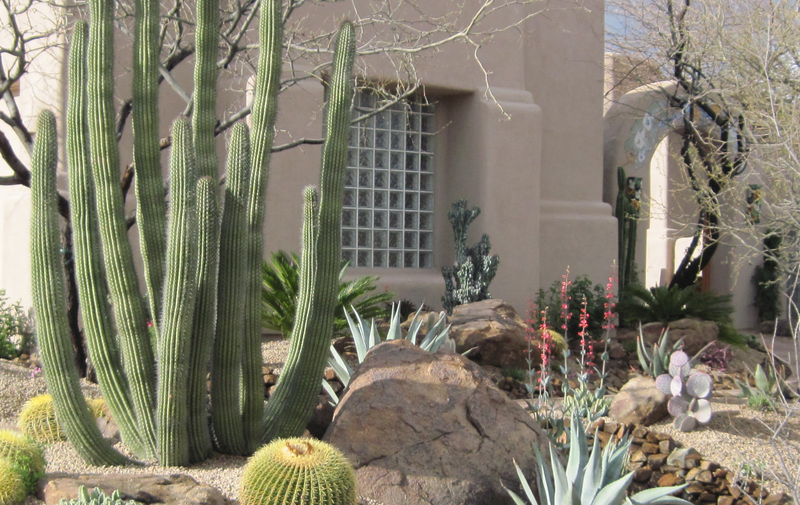 “We used a variety of cacti, such as totem pole, Mexican fence post, blue yucca and Arizona organ pipe,” Vargas points out. 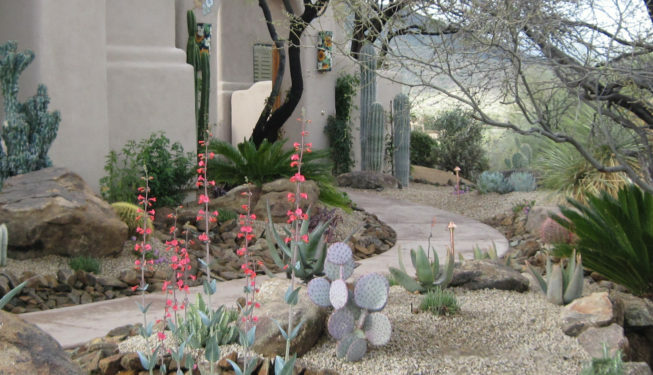 The existence of brightly painted raised planting beds offered an opportunity to create a lush-looking plantscape, says Vargas. Before he applied his creative paintbrush, “The planters looked empty and tired,” he remembers. 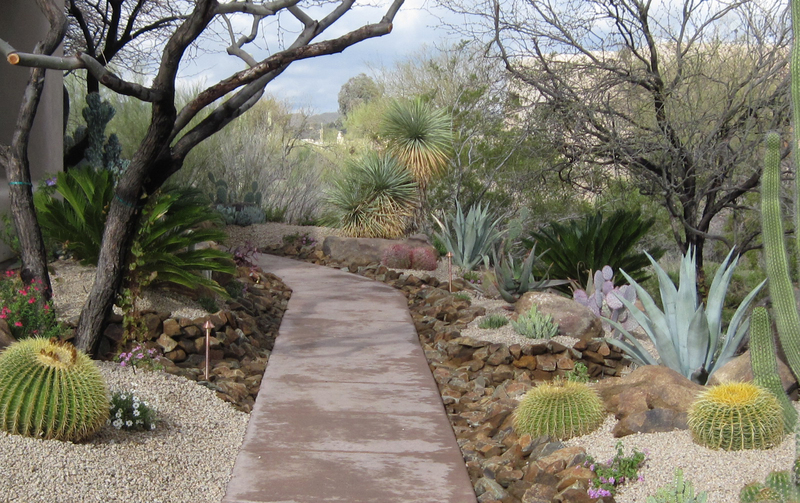 Now, they are filled with cacti and trailing flora. Colorful pots brimming with vegetation are positioned in both the large courtyard and backyard. How do these containerized plants stay so beautiful? 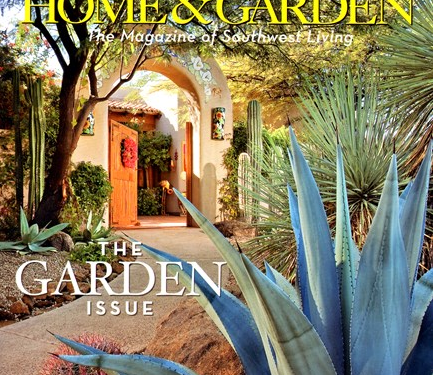 “A proper watering-and-drainage system is the most important aspect for maintaining plants in pots,” Vargas suggests. Choosing varieties with compatible water needs also is vital.